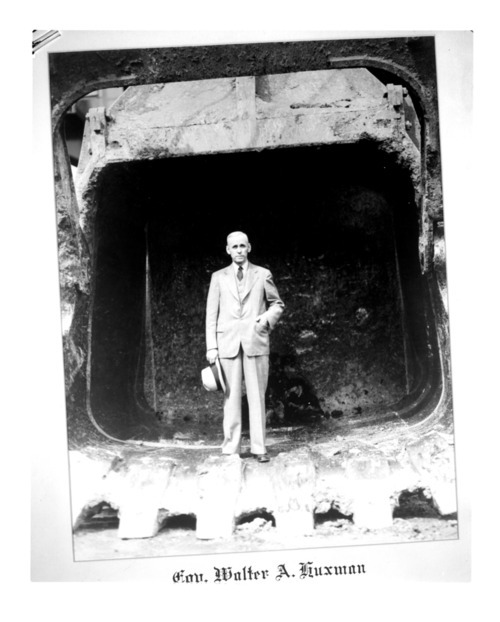 This black and white photograph shows Walter Augustus Huxman, (1887-1972) possibly standing in the bucket of a large mine or quarrying shovel. He established his career as a public official by serving as Reno County's assistant attorney from 1915 to 1919, and later as the city attorney of Hutchinson, Kansas from 1919 to 1921. He was elected on November 3, 1936, as the twenty-seventh governor of Kansas. Failing to be reelected in 1939, Huxman was nominated by President Franklin D. Roosevelt to the United States Court of Appeals for the Tenth District. He held this position until stepping down in 1962.